The tragic deaths of at least 15 children due to severe winter chill in Syrian refugee camps under United States military control has refocused attention on the estimated six million Syrians who have been displaced internally by the brutal war that has wracked the country for the past eight years. Four million more are eking out a living in grim refugee camps in Turkey, Jordan and Lebanon. Babies are dying from preventable or curable health issues. In this day and age, this is unacceptable. There are no excuses. This man-made loss of life must end. This winter has been brutal, especially in Lebanon; snowstorms have made conditions in the Bekaa Valley unliveable. Thousands have had their tents and other belongings destroyed by heavy snowfall. Those who live in some of these camps have described them as “hell on earth”. But they have no choice but to accept their fate — they can’t leave for the lack of other options. It exposes the abject failure of the international community. Countries such as Jordan and Lebanon, who have their own delicate economic and social conditions to contend with, need more help from the rest of the world. An entire generation of Syrians has grown up in the midst of unspeakable carnage of war, and grave trepidations that have resulted from it. Many have spent almost eight years in these tents, dependent on wholly insufficient handouts from humanitarian agencies. All this is because of no fault of their own. Many residents of these camps were part of the middle and upper-middle classes of Syrian society; they are skilled and educated but now find themselves in the frustrating position of not being able to provide basic necessities for their families. Every winter has proved to be brutal for the refugees. So there is no excuse for not planning well ahead. 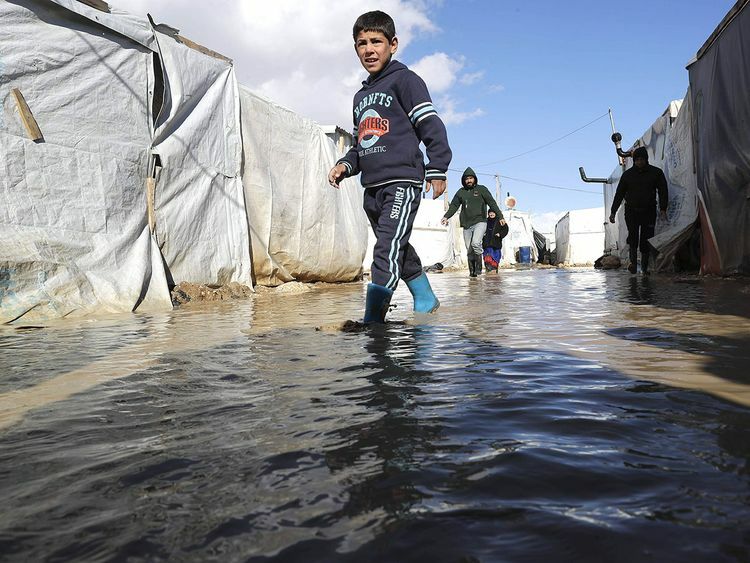 This year in refugee camps in Lebanon, for instance, families spent all day emptying their tents of ice cold water only to see another crushing night of snow, wind and flooding. Their flimsy tents provide no real protection from the elements, especially in winter. The need of the hour is to provide better housing, through prefabricated homes, for example. Syria’s war has been a tragedy of our times. Half a million people have been killed by the actions of the Syrian regime and its extremist foes. The least the world can do is to help ensure a life of basic dignity for the survivors. That would include providing adequate shelter.